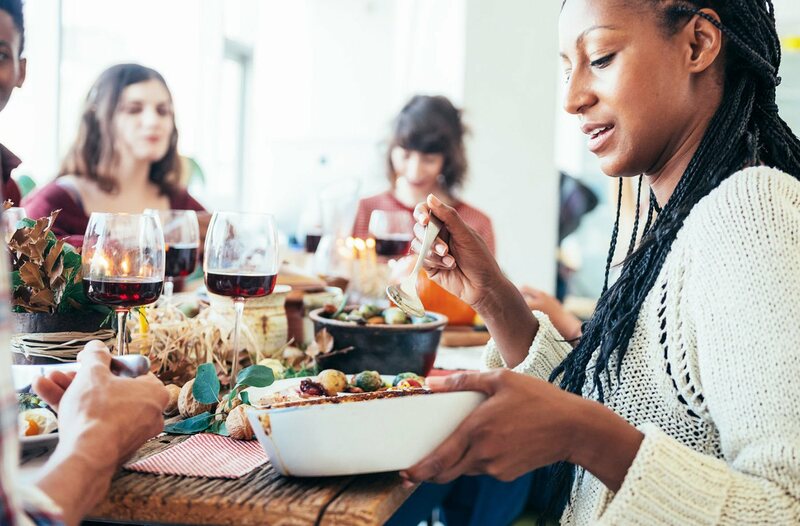 From kicking it into gift shopping mode every weekend to making your holiday party rounds, your life during the winter season—and oftentimes your diet—are thrown off track, and your gut’s the one to pay. You’re not the only one feeling this off-putting shift. Rachel Paul, RD feels you. “This time of year brings on a lot of added stress—the mental stress of choosing what to eat, eating too much, and the physical stress your body is under from the extra cold and flu germs,” Paul adds. No wonder you’re feeling a little on edge. To help find your way through this wild ride of a holiday season and avoid the dreaded head cold, too, we asked Rachel Paul to share some gut-friendly tips that’ll help you crush the season without a meltdown. Keep reading for 3 tweaks to your holiday meals that’ll ensure your gut (and overall health) is at 100 percent all season long. 1. Be mindful of added sugars and refined carbs—but don’t ban them! If you have a hankering for something sweet, eat something sweet—just be aware of the amount of added sugars and refined carbs. “Foods high in refined carbohydrates and sugars can cause a lot of inflammation in the lining of our GI tract, which can lead to bloating, lethargy, and gas,” Paul says. More than the discomfort factor, you don’t want to feel in urgent need of a nap when catching up with that friend you haven’t seen in a year. But since this is the holiday season—and sugar cookies are a must—take a moment in between helpings to see how you’re feeling. From there, you can assess and see if you need to integrate a handful of veggies just to even out the score. “Prebiotics feed your gut bacteria, and probiotics increase the diversity,” Paul says. In other words, the two work together to support your gut health as a whole. 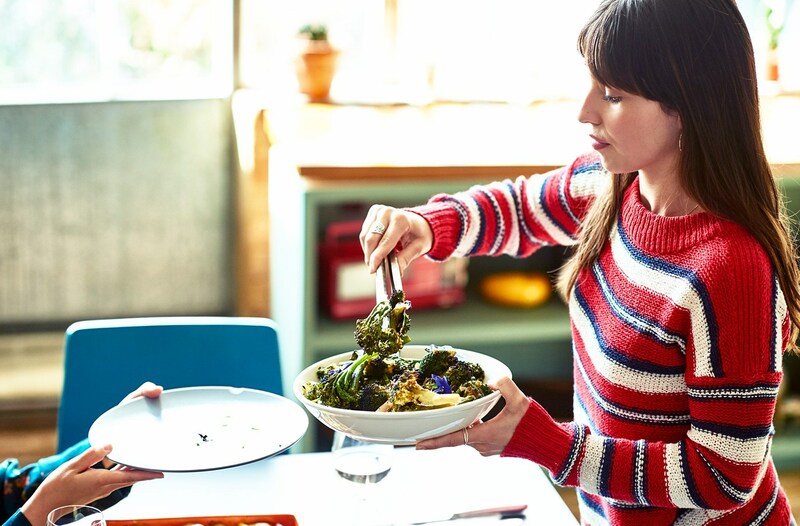 Plus, adding prebiotic- and probiotic-filled foods into your holiday dishes will not only elevate your gut’s happiness, but pack a punch of flavor. Ferment up your holiday meals (sounds weird, but works) by adding in some kimchi, sauerkraut, or a glass of kombucha. To get those prebiotics going in your system, incorporate onions, garlic, asparagus, bananas, and legumes. If the fermented foods aren’t cutting it (because, okay, kimchi doesn’t always go with everything), opt for some potent probiotics from Renew Life, which pack billions of live cultures and diverse strains to fortify your gut from the inside out. Probiotics also support immune health by inhibiting growth of harmful bacteria, according to Paul. If you haven’t heard, sleep rocks. It also affects how you eat and what you eat every day. “When we’re tired, our bodies can’t tell the difference between hunger in order to stay awake and actual hunger, so we end up overeating,” Paul adds. And if you’re wanting to keep that horrible winter cold away—knock knock, guess who helps?—yep, lots of sleep. More than fighting off sickness and keeping your mealtimes in check, there is a direct correlation with your gut’s health, too. “Poor sleep and gut’s bacterial environment go hand-in-hand—getting enough sleep also lowers cortisol levels in the body and allows the gut to repair and thrive,” says Paul. So when you’re back at your parent’s place for the holidays and everyone keeps trying to wake you up (you know for family time) you have a viable excuse, at least most of the time.